Studio Eric Klarenbeek, situated in Zaandam in the Netherlands, specializes in unusual projects. 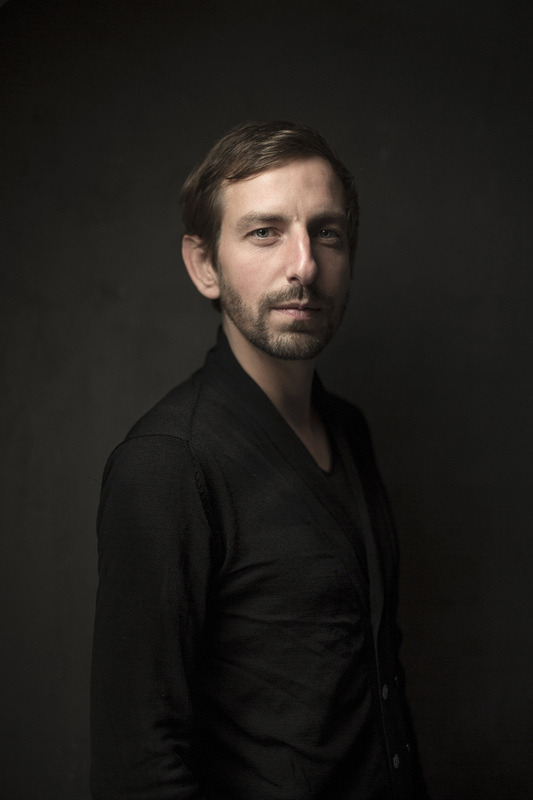 Together with Maartje Dros, Eric Klarenbeek forms a design duo concentrating on public space and technology. Their aim is to challenge and explore the use of space by connecting history, crafts and new technologies in archetypical objects to invite and evoke new use of space. The studio connects artists such as designers, architects and local crafts. ‘We search for new meaning and principles in technology, resources, objects, and spaces, for unexplored connections between materials, production methods, makers and users. Scale and appliance are irrelevant’. 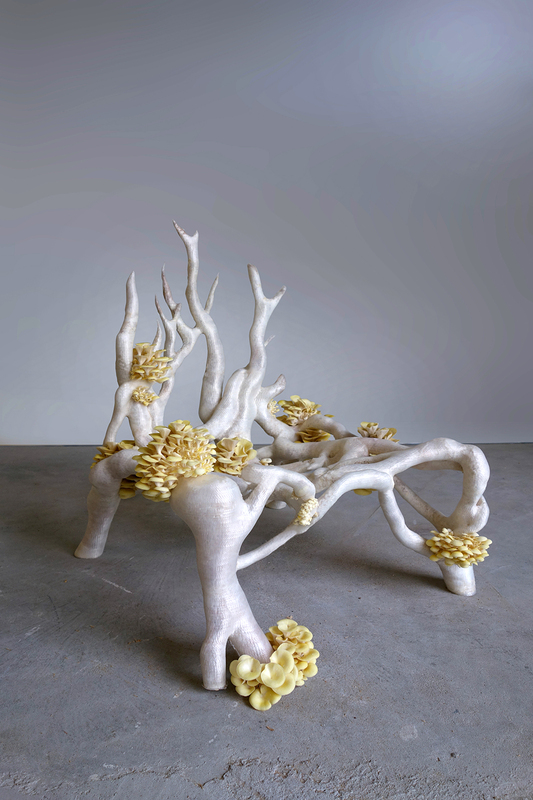 AGB: What makes your work on the Mycelium Chair important at this time? EK: Most of our surrounding products are created through intensive industrial processes. We’re imprisoned in this chain of waste, both in material fabrication as well as the negative effect on our surroundings due to transportation of these materials and goods. 3D-printing partly provides a solution, by producing locally and connecting nearby ‘makers’ through existing web portals. In the Netherlands for example, the available Maker network with 3D-printers is so dense, you can upload a design, and collect it by bike once it’s finished. The problem is the applied materials, which are mostly oil-based plastics, and industrially produced. The same goes for ‘bioplastics’, which also deals with other issues, such as the use of GMO’s. Worldwide there are very few producers of filaments, resulting in extensive transportation. Secondly there is little attention given to the working conditions of the makers, as the printers have no filters and are mostly applied in unventilated spaces. This can cause serious health risks, especially if you consider the actual ingredients are usually kept secret. As this market is relatively young, the time is now to introduce new possibilities and hand out alternatives. AGB: What part does Mycelium play in your process? EK: We have searched for ways to use local resources, and implementing growth in the fabrication process. 3D-printers work by gradually melting and layering plastics, so instead of using plastics, we pile up local land-waste, and the mycelium binds it all together. The machine simultaneously prints the infill and outer shell, which prevents its fresh mycelium and straw mixture from falling apart. After printing, we only have to wait for the structure to grow and gain its strength, which only takes a few days. This technology can be applied in a broad spectrum of applications. We started with the ‘Mycelium Chair’ as the archetype for a functional design object. Form-wise the chair is inspired by growth and reflects the unimaginable freedom of 3D printing. The popping out mushrooms are both aesthetic and a ‘proof of concept’ as you can clearly see the mycelium has successfully grown through its whole structure. 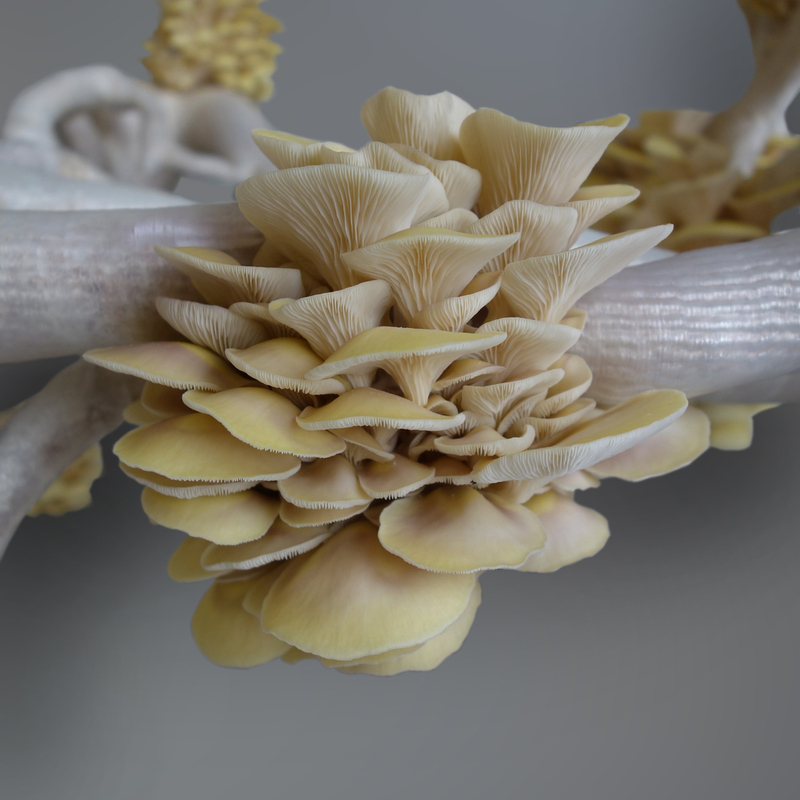 ‘Veiled Lady’, Mycelium Project 2.0, is printed in one go and inspired by the net structure of its equally named fungus. As we’ve controlled the growth of mushrooms, they’re not in conflict with its function as a stool, and hidden as jewelry within its structure. At the moment we’re working on a bigger printer for large-scale objects and on improved material properties. AGB: Ultimately what are the benefits of this process? EK: The plant material produces oxygen during its life cycle, and our production process eliminates the necessity of heating materials in the printing process, thus reducing the use of energy. Adding up those two facts, combined with the use of local resources and production, it becomes possible to create products with a negative ‘carbon footprint’. Instead of wasting less, we strive to absorb emission. After use, the product is fully compostable, and can be disposed without harming the environment. On the contrary, it will fertilize our surroundings!